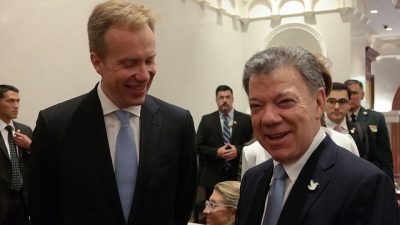 The Norwegian Nobel Committee defied most all speculation and even, arguably, the voters of Colombia in awarding this year’s Nobel Peace Prize on Friday solely to Colombian President Juan Manuel Santos. The leader of the Nobel committee claimed they’re only trying to prevent the Colombian peace process from stopping up. She wouldn’t answer questions about why the committee decided to honour only Santos and opted against dividing the prize, to also acknowledge the roles played in the Colombian peace negotiation by leaders of the FARC guerrillas, for example.”We will never comment” on those who don’t win the prize, she said, only those who do. “There are many partners” in the Colombian peace process, she acknowledged, but claimed it was Santos “who took the initiative” and kept prodding the talks along. The Peace Prize, she said, “is an acknowledgment of the very hard work and initiative that President Santos has taken,” Five said. “He went ‘all in’ as the leader of the (Colombian) government,” adding that “he is also head of state.” She discounted suggestions that FARC and others involved might feel slighted, and that leaving them out of the prize can hurt rather than boost their motivation to continue the peace process that’s starting up again in Havana. Others suggested that a Peace Prize to FARC guerrillas would simply be too controversial, also in Colombia. Asked whether awarding the Peace Prize could be viewed as disrespectful towards the referendum, Five said “no, on the contrary, we of course respect the results of the referendum” and its symbol of democracy in Colombia. 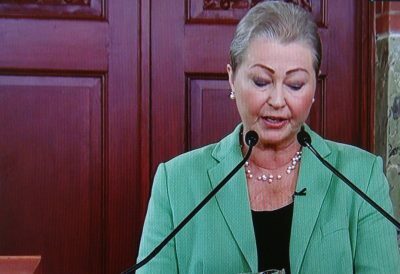 She argued, however, that “the people of Colombia did not say ‘no’ to peace, only to the agreement.” Now she and the other four members of the Norwegian Nobel Committee hope the agreement will be modified and improved so that it will eventually win majority approval. Immediate reaction to the prize announcement was muted at best, with only a few questions being asked at the traditional press conference following it. Most Nobel Peace Prize experts had dismissed any possibility that the committee would recognize the proposed Colombian peace agreement so soon after Colombian voters rejected it. Kristian B Harpviken, director of the Oslo peace research institute PRIO, had, for example, claimed earlier this week that the Colombian peace process was “simply off any credible list of candidates” because of the referendum result. Historian Asle Sveen, who has written books about the Peace Prize, agreed, predicting that the Norwegian Nobel Committee wouldn’t defy the referendum result. He had called a prize recognizing the Colombian peace process “entirely unlikely,” also because of the uncertainty regarding its outcome. The referendum result came as a shock not only to those involved but also to Foreign Minister Børge Brende, who hails from the same Conservative Party as Five. There was immediate speculation that the committee, which has a majority of politically conservative members at present, also wanted to acknowledge and encourage Norway’s own efforts at brokering peace, which have been widespread but spotty at best over the years. Since the Colombian peace pact had initially made both the Colombian government and FARC top contenders for the prize, Sveen had speculated that the Nobel Committee would have a Plan B if they’d settled on the Colombians. Maybe no Plan B existed after all. Congratulations for Santos, meanwhile, were rolling in Friday afternoon, from human rights, refugee and various other humanitarian organizations as well as from political leaders in and outside Norway. Santos himself, awakened by news of the prize in the middle of the night, said the prize could be “a great push” towards the end of the civil war in Colombia. “I’m so honoured, and so grateful,” he told Nobel Institute Director Olav Njølstad when the call from Oslo came through. “Thank you very, very much. This is a very important event for my country, for the victims of this war and this is a commitment to keep trying to bring peace to my country. I am so grateful.” Santos will receive the prize at a ceremony in Oslo on December 10, the anniversary of Alfred Nobel’s death.